UPLC/MSE is the only technique that delivers comprehensive exact mass precursor and fragment ion data from every detectable peak across the entire chromatographic separation in parallel to obtaining an accurate quantitative profile of the LC peaks. It does so by rapidly alternating between two functions - the first acquiring exclusively low-energy exact mass precursor ion spectra; the second acquiring elevated energy exact mass fragment ion spectra. Unlike the more conventional data dependent (DDA) method of data acquisition, MSE has no duty cycle restrictions, and better addresses the co-elution of components in highly complex samples. And to be sure that you only achieve the very best results, our cutting-edge informatics and software platforms are specially designed to automatically de-convolute every time-aligned precursor and fragment ion. So you're guaranteed to obtain more meaningful and more confident information than ever before. UPLC/MSE is a simple, patented method of unbiased data acquisition that comprehensively catalogs complex samples in a single analysis. QuanTof combines innovative high field pusher and dual-stage reflectron designs with a novel ion detection system in an optimized Tof geometry. This provides a totally new dimension of sensitive, high resolution, exact mass, qualitative and quantitative performance - consistently achievable at UPLC acquisition rates. QuanTof's high field pusher and dual-stage reflectron, incorporating high transmission parallel wire grids, reduces ion turnaround times due to pre-push kinetic energy spread and improves the focusing of high energy ions respectively. Together, these innovative technologies deliver the highest levels of Tof performance. QuanTof delivers exact mass accuracy with high precision across LC peaks, which in turn provides high selectivity and confidence for the detection and identification of components in complex mixtures. The novel ion detection system combines an ultra-fast electron multiplier and hybrid ADC detector electronics to provide you with outstanding sensitivity and quantitative performance in a much smaller footprint than you would ever imagine possible. QuanTof’s high field pusher and dual-stage reflectron, incorporating high transmission parallel wire grids, reduce ion turnaround times due to pre-push kinetic energy spread and improve focusing of high energy ions respectively. These innovative technologies combine to provide the highest levels of TOF performance. The novel ion detection system combines an ultra-fast electron multiplier and hybrid ADC detector electronics to provide outstanding sensitivity and quantitative performance. QuanTof delivers exact mass accuracy with high precision across LC peaks, which in turn provides high selectivity and confidence for the detection and identification of components in complex mixtures. 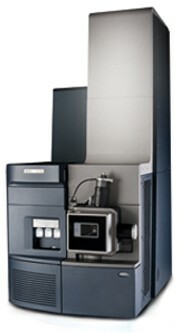 The universal ion source architecture of Xevo G2 QTof allows you to use the widest range of ionization techniques and the very latest innovations in ionization technologies. Quickly. When you need options and time is critical, the ion sources are quickly interchangeable and ready to use within minutes. We have an error happening on the Xevo, which reads, “Sample Manager FTN: Zp axis home h/w fault”.anyone has any idea please?thank you. There are no threads in Waters Xevo G2 QTof Reviews at this time.